Combine all ingredients for simple syrup in a small saucepan and bring to a simmer on medium heat, stirring occasionally, until sugar has dissolved. Remove from heat. Let the syrup cool completely, about hour, then pour through a fine sieve into a container or jar. Grease an 8-inch round cake pan. In a large bowl, mix egg yolks, both flours, baking powder, salt and granulated sugar to combine. Add cold cubes of butter, using a pastry blender, combine until only pea-sized pieces remain. Drizzle in 2/3 cup cold cream, then mix just enough to incorporate. Transfer the dough to a work surface and gently fold on top of itself to mix in any dry spots. Do not over work the dough. Then place dough into prepared pan and gently press until even. Cover and chill for 20 to 25 minutes in a refrigerator. When ready, preheat oven to 350 degrees F and brush top of cake with remaining 1 tablespoon of cream. Bake until top is golden brown and sides are beginning to pull away from pan, about 28 to 35 minutes. Remove from oven and set on a wire rack to cool; after about 10 minutes invert the pan to remove the cake and allow to cool completely on the wire rack. Toss strawberries (reserving some for garnish), granulated sugar, lemon zest and a pinch of salt in a medium bowl to combine. Transfer half of strawberries to a medium saucepan and add 1 tablespoon balsamic vinegar. Let remaining strawberries macerate while you bring strawberries in saucepan to a gentle simmer over medium-low. Cook, stirring occasionally and reducing heat if needed to keep at a low simmer, until strawberries start to break down, become jammy and liquid is syrupy, about 12 to 18 minutes. Let cool. Using a large chilled mixing bowl, whip cream with an electric mixer until soft peaks form. Add vanilla extract and sugar and whip to combine. 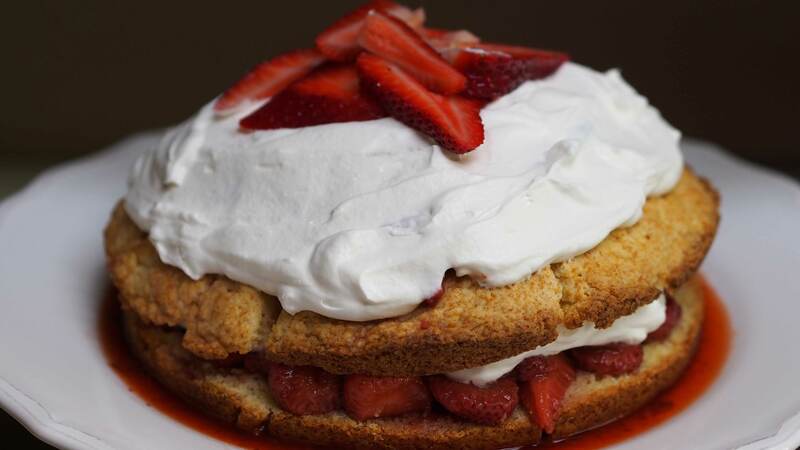 Using a long serrated knife, slice shortcake in half horizontally. Carefully remove top and reserve. Place the base, cut side up, on a serving dish. Spoon half of the strawberry compote and half of the macerated strawberries over base cake layer; top with half of the whipped cream. Place shortcake top over the base with the cut side down. Place remaining compote and strawberries on top of layer and mound the rest of the whipped cream on top. Place reserved strawberries on top for garnish. Drizzle any leftover syrup from the compote around the base of the cake. Serve immediately or chill for up to two hours.